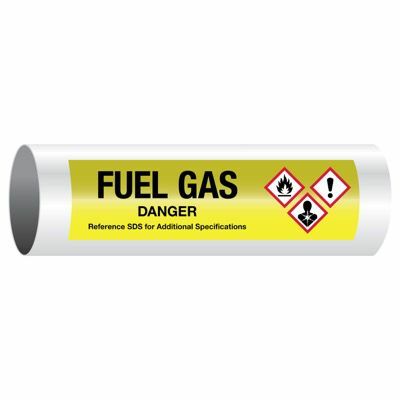 Pipe markers use GHS pictograms which meet OSHA 1910.1200 (Hazard Communication standard). Meets ANSI (ASME) A13.1-2015 pipe marking guidelines for some specifications. To be fully compliant with the ANSI (ASME) guidelines, indicate flow direction using Arrows-On-A-Roll Tape, sold separately. Temperature range is -40°F to 180°F. For indoor and outdoor use on dry and clean pipes.